Hal Bastian, board of Little Tokyo Towers will also be recognized. Little Tokyo Senior Nutrition Services (Koreisha Chushoku Kai) will hold its annual Honor Banquet on Wednesday, Sept. 26, at Union Church, 401 E. Third St. (at San Pedro Street) in Little Tokyo. Reception from 5:30 to 6:30 p.m. Dinner and program at 7 p.m.
• Brian Kito and his family have owned the Fugetsu-do Confectionary since 1903. His grandfather, Seiichi, began Fugetsu-do Confectionary in Little Tokyo and the iconic store has been in the family ever since. In 1975, Kito began working at Fugetsu-do full-time while attending Cal State L.A., eventually inheriting the store in 1986. 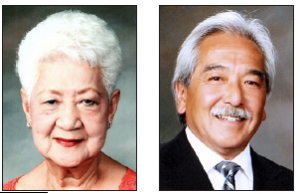 Kito’s long history of community involvement began in 1981, when he joined the Nisei Week Japanese Festival as a volunteer and became a member of the little Tokyo Redevelopment Advisory Committee. Perhaps the most inspiring example of his commitment to the community occurred in 1991, when he was asked to vice chair the new Little Tokyo Public Safety Association, a community group formed in response to the increasing crime problems in the area. He started the Little Tokyo Public Safety Volunteer Patrol, which patrolled the streets of Little Tokyo at night, added community cleanup days, and opened the Little Tokyo Koban, an information and LAPD drop-in center. By 1996, Little Tokyo was one of the safest locations in the city. Kito has been involved in numerous other community and cultural organizations, including the Historical Cultural Neighborhood Council and the Tanabata Festival, to name just a couple. He is proud to say that his son Korey has plans to take over the legacy of running Fugetsu-do, representing the fourth generation. • Aiko “June” Kawaratani is the owner of the venerable Rafu Bussan. On March 1, 1958, she and Kiyoshi Kawaratani, or “Skip” as he was fondly called, took over the business. They were pioneers in importing goods from Japan, bringing in items that no one else was selling at that time. In 1979, Rafu Bussan moved into the Second Street location where it flourished for the next 35-plus years. In 2014, Aiko lost her husband Skip, but their legacy of love of the Japanese culture, artistry and workmanship continues to this day at Rafu Bussan’s current home in Honda Plaza. Inspired by the generations of shoppers who have patronized their store, the Kawaratanis have generously given back to many religious institutions, youth organizations, and cultural organizations in the area, including the Kyodo System Japanese Language Schools, Japanese Chamber of Commerce of Southern California, Little Tokyo Service Center, Terasaki Budokan, and of course Little Tokyo Senior Nutrition Services, to name just a few. Kawaratani turned 90 years young this year, and also celebrated Rafu Bussan’s 60th anniversary. • Hal Bastian, also known as “Mr. Downtown,” has worked for the past 25 years to create the Downtown Los Angeles (DTLA) Renaissance. He served as director of economic development for the Downtown Center Business Improvement District (DCBID) from December 2001 to September 2014. At the DCBID, he facilitated bringing in over 22,000 housing units and over 300 retail businesses to support the needs of the booming Downtown population. On Oct. 1, 2014, Bastian founded his own consulting practice dedicated to building an even better DTLA. He continues to work tirelessly to make Los Angeles an intriguing and inclusive city. He is a passionate advocate of the Meals on Wheels program, improving the quality and availability of education and childcare programs, building affordable housing, and caring for the homeless population. • Board of Directors of Little Tokyo Towers. Little Tokyo Towers started as the dream of Mac Sasaki around 1970. From that dream, a nonprofit group was formed with representation from the JACL, the L.A. Buddhist Church Federation, the Southern California Christian Church Federation, and the Southern California Gardeners Federation. These organizations and other community leaders and activists worked tirelessly to get the Towers built. The first residents moved in on Nov. 6, 1975. Since the beginning, the Towers have been managed by a board comprising three members from each of the four founding organizations along with three community members. Over the years, the board has worked diligently to ensure that the Towers not only provide safe and affordable homes to thousands of senior citizens in Little Tokyo, but that they also provide residents with activities, programs, and needed social and health services. The board also supports the Little Tokyo community itself by supporting the fundraising efforts of the Little Tokyo Service Center and other community organizations and providing space for Little Tokyo Senior Nutrition Services and Nisei Week. Limited parking in the church lot. Parking also available at Sho Tokyo Parking Garage (managed by Joe’s Parking), 350 E. Second St., for $5 after 4 p.m.